visit us at waterfurnace.com * 30% through 2019, 26% through 2020 and 22% through 2021 • WaterFurnace is a registered trademark of WaterFurnace International, Inc. Your photo could be featured here. Please notify your electric cooperative. See page 4 for contact information. 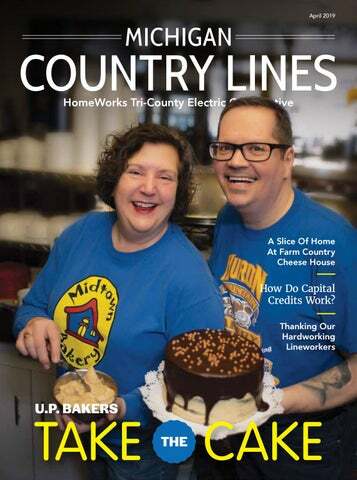 ON THE COVER Two of the U.P.’s finest bakers, Marybeth Kurtz of Midtown Bakery & Café and Joe Heck of Huron Mountain Bakery, teamed up for a current episode of “Winner Cakes All” on the Food Network. Read about their rise to local and national fame on page 14. 18 MI CO-OP COMMUNITY Michigan’s Best Hiking Trails! As the snow melts and the trees produce their first buds, get out there and soak up spring weather on these reader-recommended hiking trails. Win $150 for stories published! Enter Our Recipe Contest And Win A $50 Bill Credit! Country Lines invites members to submit their fond memories and stories. For guidelines and to submit your guest column go to countrylines.com under the MI Co-op Community tab. The appearance of advertising does not constitute an endorsement of the products or services advertised. hat does it mean to be a co-op in today’s world and, specifically, an electric co-op? So far in 2019, we’ve brought several of the Cooperative Principles to life. Co-op Principle 6: Cooperation Among Cooperatives. After a late February snowstorm that hit northern Michigan harder than our own service area, we sent two, two-person line crews with two bucket trucks to help out our sister co-op Presque Isle Electric & Gas in Onaway. Co-op Principle 3: Member Economic Participation. If you purchased electricity from HomeWorks in 2018, you’ll see two capital credit messages on your April bill. First is an allocation of the revenues exceeding expenses (capital credits) for 2018. This is not cash, but a measure of your equity in the Co-op. Then, for most members, there’s a credit that represents a capital credit retirement, or refund, of allocated margins from 2001 and 2002, and also 2018, from Wolverine Power Cooperative. Read more about capital credits on the opposite page. Co-op Principle 2: Democratic Member Control. We are guided by a sevenmember board of directors, one from each district across our service area. We have contested elections in all three districts holding elections this year. If you receive service in District 1 (Eaton, Ingham and Jackson counties), District 5 (Gratiot and Saginaw counties, along with Bingham, Duplain, and Greenbush townships in Clinton County and Bloomer, Crystal, and Evergreen townships in Montcalm County), or District 7 (Mecosta and Osceola counties), your issue of this magazine came with a special wrap that includes candidate information and your own ballot to return. Co-op Principle 5: Education, Training and Information. Besides mailing this magazine to you 10 times a year, we also travel to each district in May to hold a district membership Meeting, with a light supper, Co-op update, prizes, and more. You’ll have time to speak to your director, staff members, or me about your concerns or ideas for the Co-op. Watch your mail for your invitation/registration card! Co-op Principle 7: Concern for Community. We’re asking YOU to take part in your district meeting by bringing non-perishable goods, personal items, or a small cash donation for a local food bank in your community. It’s an easy way to help out, just like rounding up your monthly bill to donate spare change to the Tri-County Electric People Fund. As for the other two Co-op Principles—1. Voluntary and Open Membership and 4. Autonomy and Independence—well, we’ve been living those, too, right along with the five I’ve explained above. Ask me about them when you come to your district membership meeting in May! Please note that due to unforeseen circumstances, we have had to change some of our district meeting dates since we published them in your March Country Lines. Please see the back cover of this magazine for the correct dates. $1,720,382, and $2,021,431, representing HomeWorks Tri-County’s share of Wolverine Power Cooperative’s 2018 margins. These margins are not cash—they are an accounting of your share of ownership in the Cooperative. Your allocations for the year, as well as the total amount of unretired capital credits you’ve acccumulated, can be found in the top right message area of your electric bill this April. Again, this number is not a cash value but instead represents an amount that will be retired at a future date by the Board of Directors. Retiring Capital Credits Retiring capital credits is a way of ensuring each generation of members provides its own equity in the Cooperative. The philosophy of your Board of Directors is to pay most of the retirement from the oldest capital credits on account, and a smaller percentage from the most recent year. We believe this achieves the purpose of recycling the Cooperative’s capital, while also giving our newest members a chance to see one of our fundamental Cooperative Principles in action. This year’s general retirement totals $1,934,000 in power supply capital credits from 2001, 2002, and 2018. For most members, your retirement will be paid as a credit applied to your April energy bill. It will show as a line item under “Other Charges and Credits.” The board also sets aside funds for retiring capital credits to members’ estates, on a first-come, first-served basis. Estate retirements will include both HomeWorks Tri-County and Wolverine Power capital credits. For more information about estate retirements, call Member Services at 1-800-562-8232. Be sure to check out our list of unclaimed capital credits at bit.ly/HWCapitalCredits to see if you or someone you know can claim some money! Learn more today at Join.HomeWorksConnect.org! This service is not regulated by the Michigan Public Service Commission. 01 HOIST For pulling guy wire and conductor to the proper tension. Insulated ﬁberglass tool for opening and closing devices on the pole from the ground. 03 GROUND Placed between wires to ensure a line is de-energized before working on it. 04 CLIMBING BELT Worn around the waist by lineworkers to help with positioning and safety when working on a pole that cannot be reached by a bucket truck. 05 SHOTGUN STICK Insulated ﬁberglass tool for moving or adjusting live electrical equipment from a bucket truck. 06 CLIMBING HOOKS The sharp hooks, called gaﬀs, dig into the pole allowing the worker to climb. 07 PPE An acronym for “Personal Protective Equipment” which is mandatory on all job sites. The hard hat protects the head from blows and falling objects; gloves protect from high voltage, cuts or abrasions; while safety glasses protect the eyes. Hung on a device or line to let other crews know that the line is being worked on. This prevents devices from being operated and injuring those working down the line. Used to pull material, tools, and other items to aerial workers. Used to indicate if voltage is present before grounding and work begins on a line. Used to cover lines when doing work on lines that are still energized. Take control of your energy use at home today The Home Energy Express Program provides FREE energy-saving products for your home, plus free delivery and installation by an Energy Optimization program contractor. Saving money at home has never been easier. How Do I Get Free Products? Step 1: Request your free energy savings kit by calling 877-296-4319 or emailing info@michigan-energy.org. Be sure to mention the Home Energy Express Program. It takes just moments to request your kit. An Energy Optimization program representative will help schedule the complimentary delivery and installation of your energysaving products. Step 2: Your products will be personally delivered and installed by an Energy Optimization program contractor. The contractor will make sure you know how to use all the items before leaving your home. Get Started Today Before requesting your free kit, please review the following eligibility requirements. You must: •	Be a member of HomeWorks Tri-County Electric Cooperative. •	Own a single-family home or, if you are a tenant, must have the owner’s permission to have work done on the home. •	Be willing to sign a document to allow work to be done on the home by professional, trained contractors. “Four-Legged Friends,” Deadline May 15 (July–August issue) Go to homeworks.org and select Country Lines under the Electric tab to submit your photos and see additional themes. It’s fast and easy. To send by mail: include your name, address, phone number, photographer’s name, and details about your photo. Mail to Attn: Country Lines Snap Shots, 7973 E. Grand River, Portland, MI 48875. Photos will not be returned. Do not send color laser prints or professional studio photos. Mince or chop all ingredients according to recipe. Add all ingredients to a glass bowl and stir to combine. Serve immediately or chill and serve. Flavors will meld with longer chilling; 4 hours chill time is recommended. Use this as a traditional salsa or try it as a garnish on grilled chicken! ½ cup mayonnaise 1 teaspoon Worcestershire sauce ¼ teaspoon salad seasoning or seasoned salt ¹/8 teaspoon paprika 1 cup shredded cheddar cheese (or other cheese of choice) 4 slices crisp-cooked bacon 2 tablespoons minced onion 32 to 36 round crackers Mix mayonnaise, Worcestershire sauce, salad seasoning (or seasoned salt), and paprika. Stir in cheese, bacon, and onion. Spread about ½ tablespoon mixture over each cracker. Arrange crackers (8 or 9 at a time) in a single layer on microwave-safe plate. Microwave on high until hot and puffed (15 to 30 seconds). Serve warm. Prepare to taste the cake that took Huron Mountain Bakery’s Joe Heck and Marybeth Kurtz from Midtown Bakery & Café all the way to the ﬁnals of “Winner Cakes All” on Food Network. This cake recipe combines these top bakers’ skills and delivers award-winning ﬂavor straight to your kitchen. ¼ pound piece smoked salmon, diced into ¼-inch pieces 2 ripe Hass avocados, halved, pitted, peeled, and diced into ¼-in pieces ¼ cup diced vine-ripened tomato 2 tablespoons ﬁnely diced purple onion (rinsed, if you like a milder ﬂavor) 1 large, ripe mango, diced 1 jalapeño chili pepper, minced ½ bunch fresh cilantro, chopped • juice of 1 lime, or 2 tablespoons bottled juice 2 tablespoons extra-virgin olive oil • kosher salt and freshly ground pepper • tortilla chips In a bowl, combine salmon, avocado, tomato, onion, mango, jalapeño, cilantro, and lime juice. Gently fold together. Add olive oil and season to taste with salt and pepper, and gently fold again. Spoon about 1 tablespoon onto each tortilla chip (Tostitos Scoops work well for this). Arrange on a platter. Or keep in bowl and serve with chips, if you prefer. Serve immediately. Preheat oven to 350 F. Mix on low speed the sugar, ﬂour, cocoa powder, baking soda, and salt. Then add the wet ingredients in order on low; water, vanilla, oil, and vinegar. Mix till smooth and pour into greased and papered round cake pans, wrap pans with cake strips. Yields two-8-inch round layers. Bake 50—60 minutes rotating at half of the time. Let cakes cool completely. Joe’s Peanut Butter Buttercream Frosting 1 pound softened salted butter 2 pounds powdered sugar ¹⁄8 cup heavy whipping cream 2 cups smooth peanut butter Whip softened butter until light and ﬂuffy. On low speed, add powdered sugar slowly until incorporated. Add heavy cream and whip until medium consistency. Microwave peanut butter until just liquid, then on a low setting, add peanut butter and whip until desired consistency. Festive Desserts: due May 1 Tailgating Favorites: due July 1 Submit your favorite recipe for a chance to win a $50 bill credit and have your recipe featured in Country Lines with a photo and a video. Go to micoopkitchen.com for more information and to register. We know a when we see one. Your Board In Action Meeting at Portland on February 18, your Board of Directors: •	Authorized allocation of 2018 margins to members based on their patronage, including $1,720,381 for HomeWorks Tri-County Electric and $2,021,431 for Wolverine Power Cooperative. •	Approved a general capital credit retirement in 2019 of $1,934,000 from Wolverine Power Cooperative for 2001, 2002, and 2018, to appear as a bill credit for active members in April. •	Reviewed the 2019 district meetings and election process, noting that Districts 1, 5 and 7 each will have contested elections this year. •	Authorized a capital and operating budget adjustment for the fiber optic internet division to purchase splicing equipment and to hire technicians to use it. •	Reviewed the 2018 year-end MPSC Distribution Standards in which the Cooperative exceeded the minimum requirements in every reported category. •	Read and amended Board Policy 209 – Business Ethics, Conduct, and Conflicts of Interest, and accepted policies 401 – Assignment of Capital Credits; 403 – Long Range Financial Management Plan; and 404 – Retirement of Capital Credits as presented. •	Learned there were 69 new members in January. •	Acknowledged the February safety report, listing employee training as well as minor employee and public incidents involving electric, fiber optic, or propane. Time Set Aside For Members To Comment Before Cooperative Board Meetings The first 15 minutes of every board meeting are available for members who wish to address the board of directors on any subject. The next meetings are scheduled for 9 a.m. on April 22 at Blanchard and May 20 at Portland. Members who need directions to the meeting, or wish to have items considered on the board agenda, should call 517-647-7554. Alvin and Judy Garnett of Morley celebrated the 150th anniversary of their family farm in 2018. The farm, in Deerfield Township of Mecosta County, started as 40 acres originally purchased by James and Mary Buchner in 1868. Today, it’s 320 acres producing beans, corn, and alfalfa. oe Heck of Huron Mountain Bakery (Marquette and Ishpeming) and Marybeth Kurtz of Midtown Bakery & Café (Negaunee) are still fresh off the airing of their episode of “Winner Cakes All” on the Food Network, a show where pairs of bakers team up for a chance to win $10,000. The Upper Peninsula duo’s episode was fairy talethemed and led to baking a cake for host, Giada De Laurentiis, a panel of judges, and the actresses from Broadway Princess Party. It wasn’t all glitz and glam that led up to this point in the lives of either of the U.P. bakers. Both admit they needed their own fairy godmothers along the way to help kick start their culinary journeys. Be sure to check out micoopkitchen.com for Joe and Marybeth’s chocolate peanut butter cake recipe from “Winner Cakes All” on the Food Network! Joe Heck grew up in Wisconsin and eventually moved to New York City after high school. His ﬁrst job was as a night shift baker, a gig that allowed him to practice decorating cakes. “Eventually, the baker who did our high-end cakes saw my work,” said Joe. “She made me a deal. She would pay for me to go to culinary school if I’d work for her for ﬁve years.” Joe took the deal, attended the Culinary Institute of America, and then worked for his fairy godmother for 13 years. But, like in all good fairy tales, twists and turns happen. A year later, Joe hit some very hard times. When he needed it, a “genie in a bottle” presented itself. Joe’s best friend invited him to visit Marquette, giving Joe his ﬁrst glimpse of the U.P.—a place he ended up calling home. Meanwhile, Marybeth Kurtz was hustling in Detroit and, while traveling to open a new restaurant in Florida, she met a pastry chef. As if nudged by a magic wand, Marybeth ended up training with her and became a pastry chef herself. Something was missing for Marybeth too, as she and her husband began dreaming of owning a business somewhere with a little less hustle and bustle. As if on cue— bippity boppity boo—Negaunee, that is. “Everyone is very supportive and collaborative in the U.P. and small towns in general,” said Marybeth. “Everyone helps each other out.” That might sound like a well-crafted sound bite—except Marybeth was out shoveling her neighbor’s snow-packed driveway minutes before this interview. When a Food Network producer saw Joe on the local news and approached him about a possible show, Marybeth’s well-known spirit of generosity might have been exactly why Joe thought of her as a potential teammate. “I didn’t know what or when the opportunity would be,” said Joe. “Finally I got the call for ‘Winner Cakes All,’ and I called Marybeth.” Joe and Marybeth met years earlier through various charity events and have been working together ever since. “Actually, we really became friends when I stole a hexagon cake pan from her,” said Joe jokingly. The two chuckle, as you’d expect with old friends. Even though Food Network producers resisted the idea of two competing bakers on the same team, it only took one Skype call with the pair to put the producers’ worries at bay. “We’re hard to resist,” chimes in Marybeth and the two laugh again. Joe and Marybeth ﬂew to California to ﬁlm their episode with the ﬁnal challenge to create a cake for the cast party of the Broadway Princess Party. While the judges loved the team’s chocolate cake with peanut buttercream and chocolate ganache, another team edged them out for the ﬁnal win in the end. As the two get back to daily life, they have taken away great memories. “It was the experience of a lifetime. I’m so grateful we got to represent the U.P. well,” said Marybeth. Joe pauses from the jokes for a moment and offers up some advice. “Don’t be afraid to do something out of the box,” he reﬂected. “Don’t let fear stop you.” Marybeth quickly adds, “Yeah, that too!” And once again the two are in a ﬁt of laughter. Their infectious joy, friendship and love of cake baking is a simple reminder that magic, and even fairy tales, are everywhere. Owner Andrew Arens in the shop. process is being conscientious of all the products we handle,” said Arens. “The environment is very important to us. That’s where it all starts—the feed and the cows.” As a member of HomeWorks Tri-County Electric Cooperative, Arens and Farm Country Cheese House benefit from the Co-op’s commitment to preserving Michigan’s natural resources. HomeWorks Tri-County Electric and power supplier Wolverine Power Cooperative provide members with energy that is more than 60 percent carbon-free. “The co-ops’ environmental stewardship fits right in with our philosophy and goes even further towards our own efforts,” said Arens. “I appreciate that as a co-op member.” With great care every step of the way, Farm Country Cheese House has seen tremendous growth in the past year and looks forward to expanding their variety of cheeses. Their nearly 30 cheese varieties, including flavors like Farm Country Cheese House’s trademarked Michigan Jack, sun-dried tomato basil, bacon, truffle, and more, can be found at grocery stores across the state—all “homegrown” in Lakeview. To learn more about Farm Country Cheese House, visit farmcountrycheese.com, and to learn about other HomeWorks members using their “homegrown” power for homegrown products in their communities, visit bit.ly/HWHomegrown. + TIP Trying to ﬁnd the best Michigan trails? Visit AllTrails.com, an excellent resource for great hiking trails, running trails, mountain biking trails and more. Best Hiking Trails Bucket List From Fellow Members— Go Out And Explore Michigan! The Empire Bluﬀ Trail in Sleeping Bear Dunes National Lakeshore The trail leads to a high bluff overlooking Lake Michigan with panoramic views. The trail is about 1.5 miles round-trip. It’s also pet-friendly, not strenuous or technically tricky—— an absolute favorite! Best of Michigan Up Next: Best Ice Cream Shops: Help us create a “Best Ice Cream Shops” list to visit this summer. We will publish this list on the best “scoops” in our June issue. 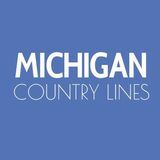 Submit your favorites at countrylines.com under the MI Co-op Community tab by April 20. LIGHTEN YOUR LOAD Well-Connect captures energy from your well water to heat (and cool) your home and eliminates the need to burn wood. Watch your mailbox for a formal invitation with more details to follow. We look forward to seeing you there!